If you’re wondering what Harry Potter and Beanie Babies have in common, you’re probably not the only one. When my daughter–now twenty-seven–was a teen, she had a profound influence on my life. Most of it was good. Although she introduced me to some interesting movies like “10 Things I Hate about You” (early Heath Ledger) and “Center Stage,” she also got me hooked on several things I’ve never lost my interest in. Yep, you guessed it. The Harry Potter books (the movies didn’t exist yet) and those cute little Beanie Babies that became such popular collectables for a while. 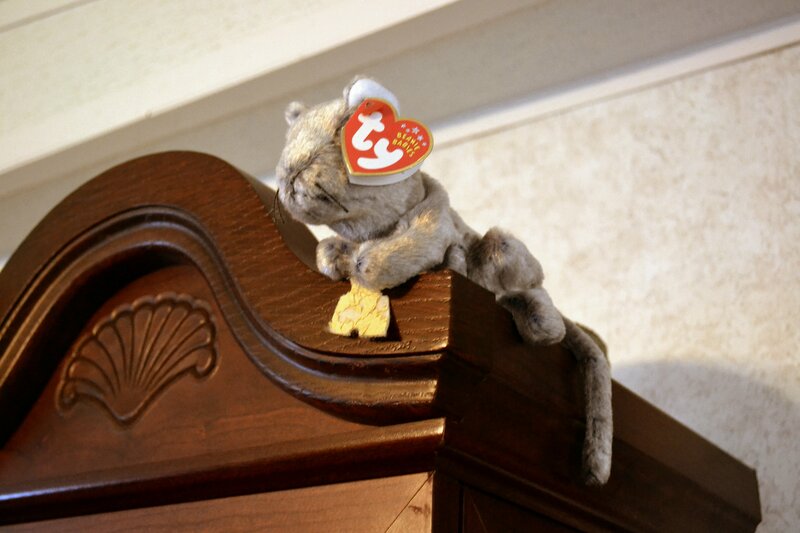 Beanie Babies, although less expensive individually, proved more dangerous. New ones came along more often. Sure, five or six dollars doesn’t sound like much, but the addiction quickly grew costly. Like other BB addicts, I was constantly on the lookout for a new source of the little critters. 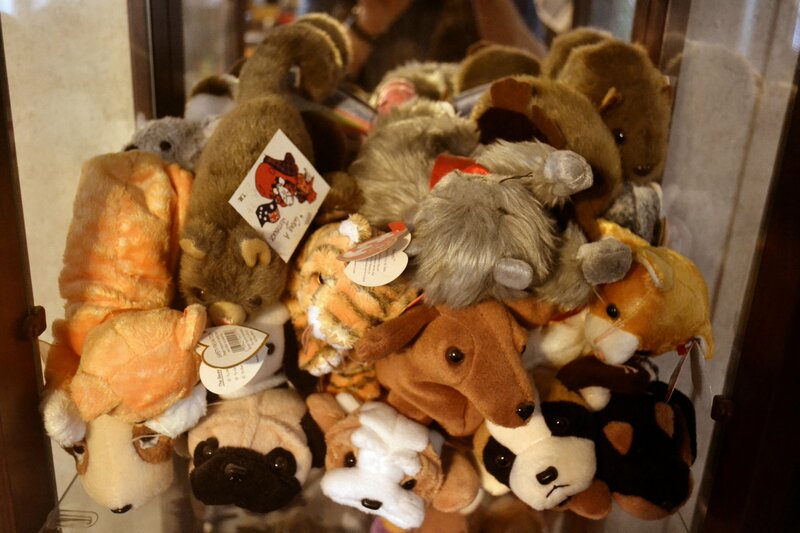 Strangely–or so it seemed at the time–Cracker Barrel often had Beanie Babies when other places had completely run out of them. As you can well imagine, however, no way could we display them all nice and neat. So we grouped them (cats , dogs , and everything else ) and dumped them on the four highest shelves, one of which you can see in photo number four. We also have a couple of them lounging playfully on top of the cabinet. See picture five. Beanie Babies also proved less controversial than Harry Potter. 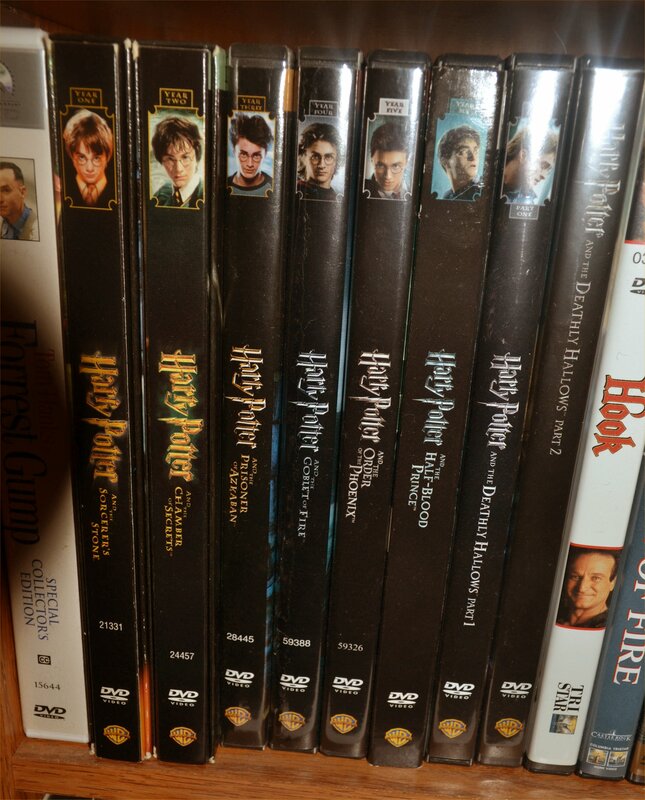 Kathleen and I sometimes have to bite our tongues to keep from criticizing ultra-conservative Christians who condemn the Harry Potter books without ever having read one of them. As strong conservative Christians ourselves, we see nothing wrong with the books or the movies. Fiction is fiction, and fantasy is fantasy. 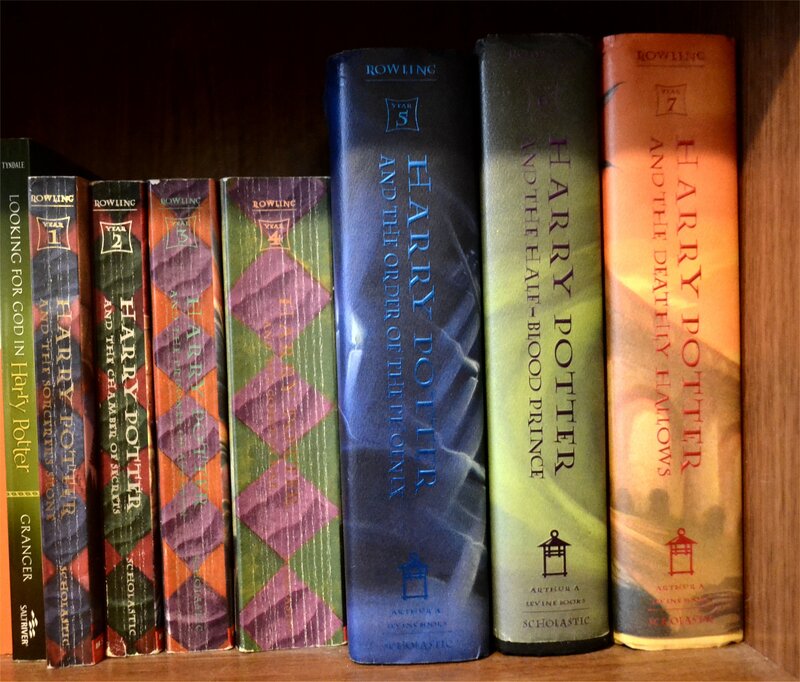 As many hours of pleasure as Harry Potter and the Beanie Babies (Ms. Rowling, wouldn’t that make an interesting book title?) have brought me, I feel it was money well spent. And something I owe my daughter a big hug of thanks for. What about you? Do you have something you’d like to share about Harry Potter or Beanie Babies? Or do you have some similar addiction you’d like to mention? We’d love to hear about it in a comment. I’ll be back again on Sunday. If you’d like to receive my posts by email, just go to “Follow Blog via Email” at the upper right. “On Aging Gracelessly” isn’t my only blog. I post lyrics of the Christian songs I’ve written over the last fifty years on “As I Come Singing”–check it out HERE. Free lead sheets (tune, words, and chords) are available for many of them. View the list HERE. This entry was posted in Beanie Babies, Harry Potter, Uncategorized and tagged Addictions, As I Come Singing, Beanie Babies, Christianity, Harry Potter, On Aging Gracelessly, Roger E. Bruner. Bookmark the permalink.